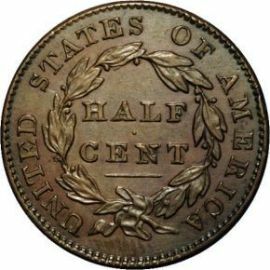 In 1809 the Classic Head Half Cent series began. German immigrant John Reich became assistant engraver to Robert Scot in 1807. Reich was looked at by Robert Scot as a competitor instead of an assistant. John Reich designed this series and after a decade of not being recognized for his accomplishments by his chief engraver, resigned in 1817. Although he resigned, his designs ran long after he left the mint. Liberty's hair is being held up by a band that reads LIBERTY. Some of Liberty's hair is falling over her shoulder to the base of her bust. The Reverse of these small copper coins is that of a laurel wreath surrounding the denomination HALF CENT in the center. The inscription UNITED STATES OF AMERICA surrounds the wreath. provided the vast majority of all copper planchets used in this series. The Classic Head series resumed production in 1825 when demand was high after the war. After Robert Scot's death in 1823 the mint appointed William Kneass as chief engraver. He modified Reich’s old hubs in 1831 and some of the changes include differences in the date, letters, and a raised rim. His modified designs were in production from 1831 to 1836. 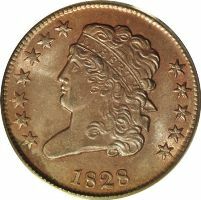 The year 1828 brought about a curious mint blunder. The 12 star obverse apparently happened when the engraver absent-mindedly neglected to enter the final star on the obverse of the coin. 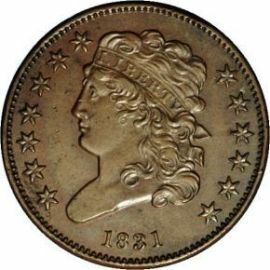 The 1809/6 mint error is one that happens occasionally as one or more of the numbers in the date are inverted in error. In this case the 9 was stamped upside-down first as a 6. Then it was turned over correctly and re-stamped. Looking closely at the picture, you can see the indentation of the 6 near the open part of the 9.